In Windows Server 2012 or later, administrators can promote a domain controller by erforming some cmdlets in PowerShell console. 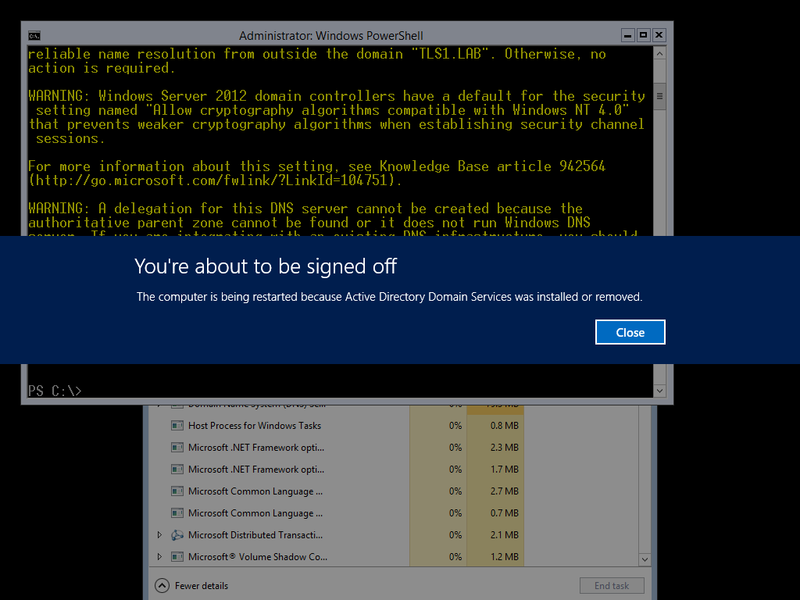 Administrators might not perform cmdlets to deploy a domain controller in GUI environment. However, if a server is in server core environment, administrators have to perform PowerShell cmdlets to promote a server to a domain controller. Promote a server which was installed Windows Server 2012 Server Core to the first domain controller in Active Directory forest. 1. On DC01, log in as local Administrator. 2. On "Command Prompt", perform "PowerShell" to enter PowerShell console. 3. Perform "Install-WindowsFeature AD-Domain-Services -IncludeAllSubFeature -IncludeManagementTools" to install features and management tools of Active Directory. 4. 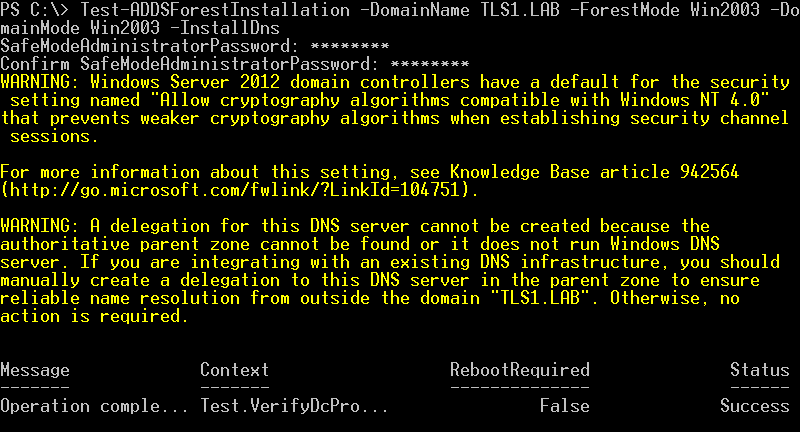 Perform "Test-ADDSForestInstallation -DomainName <Domain Name> -ForestMode Win2003 -DomainMode Win2003 -InstallDns" to run the prerequisite checks for installing a new Active Directory forest with Forest and Domain functional level at Windows Server 2003. You have to enter a "SafeModeAdministratorPassword" for this test. The "Status" of this test is "Success" so we can continue promoting a server to a domain controller. Remark: Windows Server 2012 supports the following Forest and Domain functional level: Win2003, Win2008, Win2008R2 and Win2012 and Windows Server 2012 R2 supports: Win2008, Win2008R2, Win2012 and Win2012R2. Remark: "Test-ADDSForestInstallation" and other related cmdlets are under "ADDSDeployment" module. 5. Perform "Install-ADDSForest -DomainName <Forest domain name> -DomainNetbiosNAme <NetBios Name> -ForestMode Win2003 -DomainMode Win2003 -InstallDNS" to promote the first domain controller in a new forest. 6. Enter a "SafeModeAdministratorPassword" for this domain controller. Remark: "SafeModeAdministratorPassword" is applied to recover the domain controller when entering "Directory Services Restore Mode". 7. Press "Y" to continue promotion. 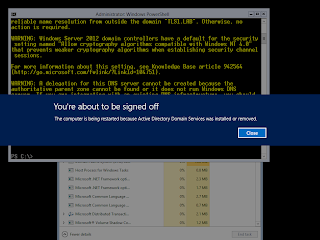 Then, the server started to promote a server to be a domain controller and then will restart automatically. Remark: We can also add other parameters for "Install-ADDSForest" cmdlet to change the default log path and the default NTDS database path. For more information, please enter "Help Install-ADDSForest -Full". 8. After DC01 restarted, log in as Domain Administrator. 9. On "Command Prompt", perform "PowerShell" to enter PowerShell console. As a result, DC01 has been promoted to the first domain controller.